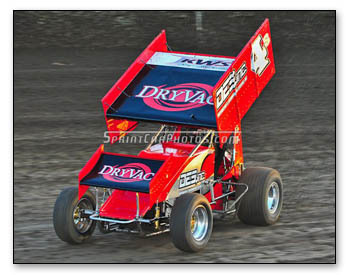 Stepping out of the seat for the final King of the West 410 event of the season this past weekend, series Managing Director Dan Simpson tabbed Loomis driver Kyle Hirst to pilot the DES Inc. No. 4s Maxim, utilizing the experimental A4MP Engine. Despite some tough luck in the main event, what transpired were very positive results for Hirst with the engine, highlighted by an exciting last lap pass for victory in his heat race. It was only the second start of the KWS season for the 23-year-old, but showed exactly why hes one of top sprint car drivers in the west. Hirst began the evening by clocking the 13th fastest lap in qualifying out of 28-cars, which put the DES Inc., Simpson Percherons No. 4s sprinter on the front row of the third heat race. At the waving of the green flag in the 10-lap contest Hirst fell to third, but had a toe to toe battle with Brad Furr over the opening two circuits. He eventually won out in the fight for second and then tried his hardest to track down leader Peter Murphy. Driving the wheels off the car Hirst marched closer and closer to Murphy and with the white flag waving, he would make his move. Hirst set up Murphy beautifully in turns one and two and swept by the Aussi native heading down the backstretch to pick up a thrilling victory. Hirst was then running solidly among the top-five in both the dash and the main event, until a pair of separate problems sidelined him from the action. First off in the dash a broken drive shaft resulted in him scoring an eighth place finish and then a broken rear end in the main event forced him to the infield with nine-laps down in the 30-lapper. The A4MP is a motor package that derived from GM's LS engine program primarily because of the high volume of production and after market engine components. The motor can be built for less than $20,000. Once a builder has been approved and the motor builder has secured the required bond, which binds them to maintain the integrity of the motor in each aspect or face financial repercussions, the A4MP website will list them as certified builders and include contact information. The site will also maintain a registry of all A4MP engines built, making it easy for competition directors to find out details of a particular motor at any given time. The A4MP engine has been approved for usage with a number of racing organizations and tracks across North America including Knoxville Raceway, the All-Star Circuit of Champions, Interstate Racing Association and the Golden State King of the West Sprints.